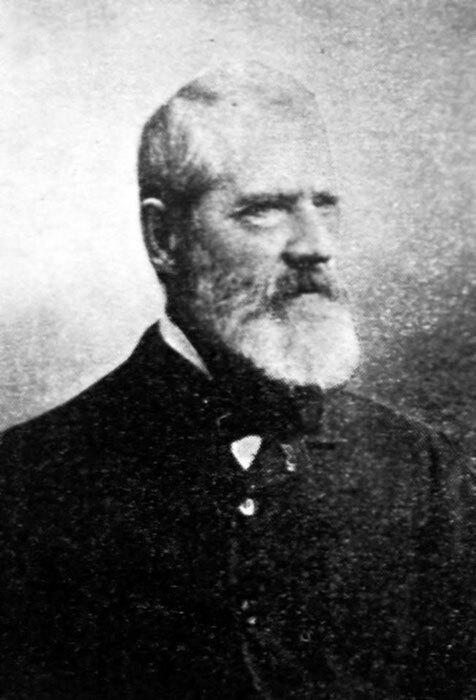 The French diplomat and philologist Auguste Dozon (1822-1890) was born in Châlons-sur-Marne. He studied ancient and modern literature at Sainte-Barbe College in Paris and, after further studies in law, worked for the ministry of the interior. He was later transferred to the Directorate for Fine Arts and was responsible there for the protection of historical monuments. Dozon was passionately interested in foreign languages and peoples, and embarked upon a career as a professional diplomat. The French foreign ministry seconded him to the Balkans, where he served as French consul in Belgrade (1854-1863), Mostar (1863-1865, 1875-1878), Plovdiv (1865-1869), Janina (1869-1875), Cyprus (1878-1881), and Salonika (1881-1885). He was particularly interested in the Albanian language, which he had begun to learn in Janina after meeting Johann Georg von Hahn and young Albanians studying in the one-time capital of Albania. The fruits of his research in Albanian language and folklore, in particular Albanian oral literature, are to be seen in his books “Manuel de la langue chkipe ou albanaise” [Handbook of Shqip or the Albanian Language], Paris 1879; and “Contes albanais, recueillis et traduits” [Albanian Folk Tales, Collected and Translated], Paris 1881. The following is a report on his journey through Albania, ‒ from Janina to Korça, Ohrid, Elbasan, Tirana, Lezha and Shkodra ‒ which he submitted in 1875 to the French foreign ministry. Localities Visited and Distances (in hours): Ianina to the han of Kalibáki – 5,40; Kalibáki to Laskovíki – 8,30; Liaskovíki to Ersék (government of Salonica) – 6,07; Ersék to Gortcha – 7,30; Gortcha to the monastery of Saint Naum – 8,15; Saint Naum to Okrida – 5,30; Okrida to Elbassán (government of Prisrend) – 18,00; Elbassán to Tiráná (government of Scutari) – 10,00; Tiráná to Króya – 4,00; Króya to Alessio – 11,15; Alessio to Scutari – 6,15; Scutari to Antivari – 11,00; Antivari to Corfu by sea, Santi Quaranta to Ianina – 21,00. An hour and a half from Ianina [Janina] was the Lykótomos causeway, which is at least one kilometre long and almost two metres wide, including the very low parapets. It was constructed ten to twelve years ago by an inhabitant of Zagóri [Zagoria], a region for which this bridge is particularly useful in winter, although its usefulness has diminished substantially since the digging of several canals that have lowered the level of the water in the lake. The marshes have almost entirely disappeared. The cost of this primitive construction, or let us say at least, the expenses that were earmarked for it, are said to have been 600,000 piastres (about 138,000 francs). Repairs are carried out on it from time to time, though always insufficiently. Since the Porte neglects to carry out any public works and, what is more, allows those constructed by the one-time native pashas of Shkodra to fall into ruin, it is rich and generous patrons who sometimes make up for what is lacking. Around Ianina there are several examples of this type of ‘pious works’ (I say ‘pious’ because religion is what inspires most of them). Unfortunately the work, carried out by unskilled masons, is neither well done nor durable. The valley of Ianina ends an hour and a half beyond the bridge (the whole valley may be about 40 kilometres in length at its greatest extent). The road then runs through a narrow canyon bordered on the right side and to the north by the Zagóri mountains. It is more or less barren, with the exception of some verdant bush oak. The hills on the left side are covered in thickets of ordinary oak trees. The road then takes a sudden turn to the left and opens out onto the plain of Kalibáki, an extension of the valley of the Kaloma [Kalama] river that flows at the foot of a chain of high, steep mountains that forms the end of the valley on the opposite side. The plain which is almost round in shape, is cultivated, mostly with wheat. A spring gushes from under one of the walls of the han and, a quarter of an hour further on, another, much larger spring is the source of the pristine creek which we crossed over on a stone bridge. At the end of another canyon is the large village of Maurovuni on the left, whence we descended into a stony basin where several villages are to be found, such as Ali-Zot, Chiftlik, Rupchia, Vishani, etc. All the inhabitants of these villages are Christian and Greek. The houses are large, made of stone and make a good appearance from a distance. Before us, from this point (Maurovuni), was the Nemertzika [Nemërçka]. On our left was lofty Mount Voshtina and on our right, two hours further on, was the massif of Papingo which constitutes the end of Zagóri. We climbed up through a gorge to the top of a hill from where we could see the vale of Konitza, a town on the other side situated on a slope facing the south. Farther up were the Vaïoussa [Vjosa] river and the Vaîdo-mati river. The latter emerges from another gorge of the Papingo range, whereas the former comes out of a much deeper gorge just below Konitza. The circle of mountains formed by the Papingo range with its snowy peaks covered here and there in fir trees was quite impressive – a real Alpine environment, the most beautiful part of Epirus that I had ever seen. The Samarina mountains, a region inhabited by the Vlachs, continue to the north of Zagóri. We enjoyed the view for about an hour. The road, often quite muddy, followed the mountainside which here was covered in a mixed forest that included several varieties of oaks, maples, plane trees, ash, hornbeams, sumach, rowan trees and blossoming Judas trees, but a peasant woman who was up in one of the trees and was hacking away at it with an axe, proved that the beautiful forest would not be there for long. This mountain is the southeastern spur of the Nemertzika. 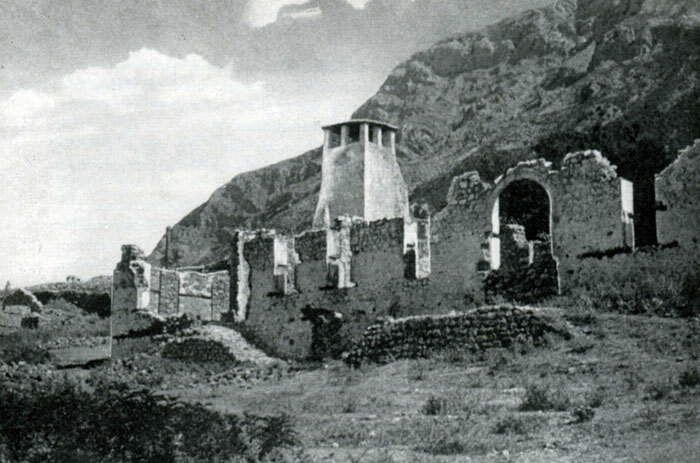 The village of Ostanitza that we crossed through had about sixty houses, several of which were in ruins, as well as a tolerable church constructed in 1856. The church contained some dreary paintings, but had a finely sculpted and chiselled wooden iconostasis which was quite a delight to look at. It was fashioned by seven or eight workers from a village near Konitza. It is from this region that most of the construction workers stem. They are masons, carpenters and roofers, and some of them do wooden sculptures which almost all serve to decorate churches. In some of the churches I saw iconostates completely covered in gold. Ostanitza is on a steep slope that descends towards the Vaïoussa. The soil here consists of shale and is furrowed by a good number of deep ravines. Without help from some goat herders we would not have found our way through the bushes. The Vaïoussa Bridge which, in this region they call the ‘little bridge’ for some reason I do not understand, is 73 large paces long and 2.66 metres in width. It is composed of three main arches and four smaller ones. It is situated on a rock face, or rather a conglomerate that forms twin islands about one hundred metres in length. The river flows through the gravel. At that time, it flowed entirely under one arch that was about ten metres in height. The bridge is said to be the work of Kurt Pasha of Bérah [Berat], the father-in-law of Ali Pasha. There are hans on both sides of the bridge. The river continues in a northwesterly direction down the valley of Permet [Përmet]. Passing through it, we climbed up along the right bank for a while but left the valley soon thereafter to cross the Samarina [Sarandaporos] river which flows into the Vaïoussa farther on. The bridge here, also made of stone but not as big, is curiously known as the ‘big bridge,’ perhaps because it rises higher over the water. The distance between the two of them is 30 to 40 minutes. 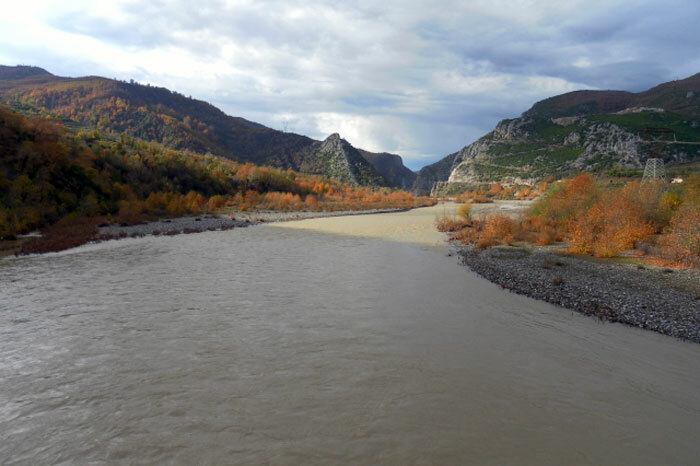 The Samarina river here constitutes the border between the Greek and Albanian populations. The first village where Albanian is spoken is called Glina [Glina] and consists of four scattered homes. The inhabitants are Muslims. To get to Liaskoviki [Leskovik] we climbed for half an hour up the deep ravine of a little river, the Lengaritza [Lengarica], that divides the two high hills. On the left slope there were extensive vineyards. The road through the ravine took the right slope, at the upper end of which was a settlement on the crest dominated to the west by a large cone-shaped summit called Mount Melisin [Melesin]. It was surrounded by other stony and barren peaks, one of which, on the northern side, was called Humelina. The Muslims who make up over five-sixths of the population of Liaskoviki almost all call themselves beys. Many of them live off tithe-farming (iltizam) which they seem to have succeeded in. They have made enough money to buy country estates in Thessaly. They were once considered very fanatic and it was only seven or eight years ago that they allowed a church to be built. The Bektashi sect has spread among them and the number of adherents has risen to sixty within the space of a few years. Since the time I was there, as I have learned, Abbar-bey [Abaz bey? ], with whom I stayed, has died and a dispute had broken out between his brother and a Bektashi adherent as to the form of his burial. Neither of the men leaves home without a troop of armed guards, a common phenomenon in Albanian regions where blood feuding is in full force. On leaving Liaskoviki, the road initially follows along a barren, stony ridge, typical of the surroundings, and then soon descends into a sort of valley bordered on the right by a rather high chain of hills covered in part in fir trees and called Poerlyokura [Përlikura?]. It ends in a flattop summit called Anemmik (inimicus) [enemy]. A small creek that we forded, called Sotíri, flows out of this mountain, on one extension of which was the village of Goermoéñ or Gueurmeugne [Gërmenj], below which is the border between the two governments of Ianina and Salonica. This can be seen in the sections of the road that were repaired three years ago. There is another river with a stone bridge that also comes in from the north. It takes the name of a nearby village, Lyoúm’i Çályoesi [Lumi i Shalësit]. From Goermieñ which is situated above a narrow gorge with a swift-flowing river, to the bridge, the path follows the mountainside through a forest of Scots pines, already quite thinned out. The soil is of clay and the trail is full of potholes. One cannot imagine how horses could cross through here in the wintertime, in particular because there are a great many little creeks flowing down from the mountains that must rage as torrents at that time of year and greatly increase the dampness, not to mention the snow. A series of hills and dales on rocky soil led us to the plain of Kolónia [Kolonja]. It is a huge, longish-shaped plateau, quite high and cold. It is surrounded on all sides by mountains and hills. The high chain to the right or to the east bears the Bulgarian name Razdol [Razdoll] and farther on it is called Grammos [Gramoz], which is the extreme northern part of the Pindus range. The soil on this plateau did not look particularly fertile. It was not the same everywhere and was furrowed by the many creeks that come down from Razdol. Kolónia consists of sixteen villages, two or three of which are Christian. The surrounding forests have been completely destroyed. Ersék [Erseka], which has recently been made the capital because of its central location, consists solely of four hans or inns and five or six scattered houses, with a mosque and a Turkish school under construction. The kaimakam [mayor] of the kaza [district] on which sixty villages depend, and the kadi [judge] both live there. Their official residence, the hukioumek [government building - hükûmet], is in ruins so that these two officials have had to find other lodgings at their own expense in two of the neighbouring houses. The people of Kolónia have a very bad reputation. The treasurer of the kaza, a Christian, whom I had asked to come and see me, replied that the place was not safe and that no one left his house after sunset. People were fearful of dangerous encounters. The plain of Gártcha [Korça] is separated from that of Kolónia by a range of low hills crossed by the little Kozéli [Kozel] river with a stone bridge. The soil looked equally poor, although the town market was lacking in nothing of importance. Every week four to five thousand kilos of grain are sold there. Gártcha is situated on the northern side of the valley and plain, at the very end of which are the hills of the Grammos range. These are covered in numerous vineyards which, however, were already damaged by the late frost. It spans a torrent that is crossed by two wooden bridges. This town that geographically and administratively belongs to Macedonia was somewhat of a surprise for me because people had spoken badly of it in Ianina, describing it as a den of thieves. I found it, on the contrary, to be quite developed. For the last three or four years it has served as the seat of a mutessariflik [governor’s office]. Less than one-sixth of the population is Muslim. They make up about 200 of the 1,500 houses. There are only two mosques, one of which is very small. The rise of Gártcha since the Crimean War is due to the many Christians who settled in Egypt, some of whom have returned and are well-off. Through their contacts with the Franks, they have acquired a certain inclination for material and intellectual progress that can be seen in the construction of European-style houses and in their efforts to spread education. The government has not contributed a cent to institutions devoted to education. All expenses are covered by the interest (70,000 piastres) from a legacy of 7,000 Turkish pounds (161,000 francs), supplemented by 30,000 piastres from the annual revenue of the churches, as well as voluntary contributions from the inhabitants. The administration is in the hands of a charitable society, at a meeting of which I took part. The first article of their rules stipulated that assistance was to be provided to everyone irrespective of their religious beliefs. The Christians of Gártcha are to be admired for the sacrifices they have made to educate young people and to assist the poor because, just like the inhabitants (of all religions) of other Turkish towns, they are subjected to the taxes that the government and its agents impose from time to time, and from which they cannot escape unless they wish to incur the disapprobation of the authorities. For instance, the pasha, a Circassian, who has been serving here for three or four years, had a government mansion (serai) and barracks for the gendarmes built here at the expense of the population. The buildings are sizeable and solidly constructed in stone. At the same time, the leading merchants agreed to build a telegraph station at their own expense. And what a waste of money it was! They have still not managed to put up the wires or to hire a single employee, despite the fact that it is only a distance of fifteen hours to connect the telegraph to the main line at Monastir. The lack of roads also puts this town at a disadvantage. The population of this region, Muslim and Christian, is entirely Albanian, right down to Okrida [Ohrid] which is the ethnic border. In the surroundings of Gártcha, there are only two little Bulgarian villages, and a winter settlement (kalyvoe) of Vlachs, called Plana, with 350 huts. Moschopolis, or more accurately Voschopolis, a Greek-Vlach town what flourished in the last century and is situated three hours from here, has been reduced to 120 houses. Depredations by the Muslims forced the inhabitants to scatter and, according to the pasha himself, they are no better off today. Complaining about this and yet praising the Christians, he boasted that he had reduced the number of vendetta killings to about 50 in the three years he had been in office, whereas in the years preceding his arrival, there had been about 300 such killings and the authorities had done nothing to prevent them. Leaving Gártcha, the road carries on over the plain, crossing several muddy ditches with creeks in them, the most important of which being the Dounavek [Dunavec]. They caused much difficulty for our horses because there were high dikes on both sides of them to prevent flooding. The plain turns left and becomes a narrow valley. It is well cultivated and the soil looked better the more we progressed. The oxcarts are hitched up to four, six or eight oxen or buffaloes. They have high wheels and the larger ones are preceded by a trailer cart. The settlements are no longer made of stone but of mud bricks and look like Bulgarian villages. Boulgaretch [Bulgarec], the first village we came across, is one hour away from the town. The trail then turns towards the left of the valley and follows around Lake Sóviani [Sovjan]. A little creek that we crossed on a rickety wooden bridge, emerges from the lake here. I was told that it was the Dévol [Devoll] that continues in the direction of Lake Malik [Maliq]. A short way before reaching it, we passed and left on our right the village of Libonik [Libonik] which is almost at the edge of the lake and from where one can see Sóviani in the distance on the right. I was quite surprised to discover where I was as the detour around the lake was quite considerable. The lake is surrounded by vast marshes and rushes. They catch good eels here. It seemed to be larger than the lake of Ianina. At the far end, it opened onto the village of Zvírina [Zvirina]. The han of the village of Velitoern [Velitërna] is a wretched building. It must be a peasant house because we would otherwise not have seen any women. After this, the road follows for another hour and a half along the left side of the valley, after which it enters a hilly section covered in vegetation, with the heights gradually increasing as we progressed. The road now enters a valley, that of Tcherana [Çërrava] river, named after a Muslim village on the other side of it. We crossed it several times but it was not carrying much water. The valley is bordered on the right side by a lofty mountain called Galitchichté [Galičica / Mali i thatë] that stretches down to Lake Okrida [Ohrid], the vast basin of which we could now see. At about the same time, at a short distance away on the left, we caught sight of the monastery of Saint Naum, built on a small headland lapped by the lake. To get there, we crossed a wooden bridge over a crystal-clear river which forms a circular basin interrupted by two little islands. It comes down from Lake Presba [Prespa] which, on the maps, seems to be connected to Peupli. I was told they were called upper Presba and lower Presba or Peupli. Between the lake and the mountains there is a thin stretch of land about one kilometre long that is cultivated and planted with poplar trees. 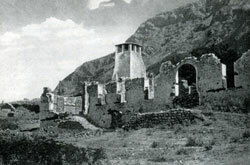 This is the çiftlik or domain of the monastery, which also owns two other çiftliks near Gártcha. Saint Naum is very well known in this part of Turkey and I had heard so much about it that its miserable appearance, both outside and inside, quite disappointed me. All that they were able to give me as a sitting room was a rather plain salon dripping in water because a rainstorm had been raging for several hours. Although there are rooms in another part of the complex that are used to receive for foreign visitors and pilgrims who are said to arrive in good numbers at certain times, that part had burned down a while ago and was currently being reconstructed. The monastery has only four monks. The father superior is a Cretan, an ailing old man who has been here for twenty-seven years. He came from the Sinai Peninsula. As an assistant, they gave him a lay kiaya. The water in the lake is beautiful and very pure. The lake is some six hours from south to north. It took me five hours or a bit more to get from Saint Naum to Okrida [Ohrid], and from the site of the convent it takes about an hour to get to the bottom (southern) shore. On this side, the lake is much narrower than in the northern part, where it may be some four league wide. The lake is surrounded by mountains, the foothills of which almost everywhere bathe in its waters, with the exception of a small plain at the southwestern corner, another one around the promontory on which Okrida is situated and a third one around Strouga [Struga] situated to the north and left of that promontory. Below the monastery is a small sandy beach, though it is interrupted by a rocky peninsula covered in bushes. On the small plain to the southwest and on the mountain slopes along the lake one can see several villages, all of them Albanian, although the names of the ones I was told about were Bulgarian: Staròva [Starova] and Pagra-Dìtzka [Pogradec]. I believe the Chkoumbi [Shkumbin] takes its source not far from here. I got the names from Muslim peasants who stemmed from these villages and with whom I spoke in Albanian. To the east, the valley which ends near Saint Naum seems to form the limit of the Bulgarian population. The inhabitants of the three little fishing villages on the shoreline between the monastery and Okrida are all Bulgarian. The rowboats are bulky looking, but are constructed solidly so that they can withstand storms. They are long, narrow and raised obliquely. The side walls are vertical and they are equipped with a two outer beams nailed to them at the water level to keep their balance. The lake is full of fish and is particularly noted for its excellent trout of which there are three species: red-spotted trout, black-spotted trout and salmon trout. Since there are no restrictions on the fishing season, I was told that the fish were declining. The cost of a fishing licence rises every two years. It is now at 380,000 piastres. The centre for fishing is Strouga where the river Drin takes its source. Half of the trail from Saint Naum to Okrida, a total of five hours, passes through the mountains. When it descends to the lake, it stretches along marshy sections. To get into town one advances for about one kilometre on a low boardwalk, completely broken up, that stretches between the lake and the gardens of the Muslim quarter. When I passed by, mighty waves were crashing over it as if it were the open sea. It is a dangerous section for horses. Okrida is a terrible town, all made of wood. As in Bérah [Berat] and Philippopolis [Plovdiv], the Christian quarters are on the slopes of the long promontory that stretches along the lakeside. It is crowned by the ancient acropolis. The Muslim homes stretch freely out onto the plain. Okrida, which was always the seat of a Greek bishop, has in the last few months also acquired a Bulgarian bishop who was appointed as a result of the schism that broke out between the two peoples. I have elsewhere spoken of the difficulties that the poor Greek bishop, Monsignor Meletios, had, as I slept right beside him at his most recent asylum, a one-time school room. He was denied a church for four years and was not even able to bury the dead of the some fifty (Bulgarian) families that recognised and still recognise his authority. They had to be transported to Saint Naum. The church near which Monsignor Meletios had come to live in order to defend it, if needs be, is the most interesting of the ten churches in Okrida. It is the old metropolitan basilica built in 1298 under the Emperor Andronicus Comnena, as can be seen in an inscription that still exists there. It contains an object that is quite unique for churches of eastern rite – a statue. This wooden statue is roughly worked and is said to portray Saint Clement of Rome, the apostle of the Bulgarians, and probably originally adorned his tomb. According to tradition, before the Turkish invasion, it was located in another church of the same style called Saint Sophia. It still exists today but has been converted into a mosque. One can also see the images of saints on velvet that was gold embroidered by imperial Byzantine princesses. In the courtyard of the church, there are three stones embedded in the wall of the school that bear Greek funerary inscriptions, only one of which is complete. Still remaining are considerable portions of the fortifications that defended the town in the Middle Ages. They offer no particular interest. Leaving Okrida, the road continues along the lakeside, separated from the water by a strip of marsh. We arrived in Strouga two hours and twenty minutes later, a depressing-looking town inhabited by Muslims and Bulgarian Christians. The town itself is several hundred metres from the lake, and spans its emissary, the Drin river, which we crossed on a wooden bridge. This is the centre for fishing and the fish trade. The dikes along the river and the draining of the marshes it once flowed through are attributed to the Bulgarian King Samuel (11th century). An hour and a half later, having passed through what remains of a grove of chestnut trees, the road enters a forested mountain region interrupted here and there by clearings. This is the beginning of Ghegeria. The Albanians here are distinctive in their language and often in their physical appearance from those of the south. Domouzova [Domosdova], meaning the Plain of Pigs in Turkish [domuz ovası], is an extremely deep funnel. One is forced to descend an endless slope to reach the bottom, only to have to climb just as far up the other side. On the slopes are several Muslim Albanian villages. The floor of the valley is a muddy but cultivated plain about a league in diameter. A peasant, with a rifle hanging from his shoulder, was busy digging a ditch. The custom of going out armed is much more usual here than in Kolónia or in Epirus. The valley of the Chkoumbé [Shkumbin] river, the southern bank of which we reached, is spectacular. The bottom of the valley is hardly much wider than the river itself, the murmuring of which we could hear. The hillsides on the two sides rise to considerable heights. They were veritable mountains, the terraced slopes of which were covered in forests with clearings. The views were impressive. We crossed the river on a bridge and, half an hour from there, on the other bank we came across a little village of 20 houses called Kyoùkos [Qukës], with two hans and a guard station of zaptiehs. It was on this road that I learned that the mail had been robbed a few days earlier. We left the valley but re-entered it six hours later at the Békyar bridge. Soon thereafter, following a long climb, we could see the little village of Djoura [Xhyra] in the distance on the left side. Near it was a particularly picturesque site. The little Palaréka river tumbled almost vertically down through a narrow ravine onto a bed of rocks. Looming over the road were huge slopes covered in large trees that have unfortunately been burned. The Vlach nomads, who begin to appear here with their flocks, are the culprits, arsons par excellence. We continued down the Chkoumbé along a humped ridge between the very narrow and deep valley of this river and that of the Gostim [Gostima] that emerges from a narrow gorge and flows into the Chkoumbé near the bridge that leads over to the right bank. The bridge, Oúra e Bekjarit [Ura e Beqarit], is quite sizeable in its dimensions, at least in its length. It is four and a half metres wide. There are four arches, two of which are divided by thick pillars with niches in them. The cobblestone forms an angle at the highest point of the main arch and descends rapidly on the other side to the right bank. On this side, there is a small field that corresponds to the area where the Gostim flows in. On it are a number of rice paddies. Further down, the trail is bordered by thickets of plane trees and follows in the bed of the river itself. Where the valley grows narrow, the trail rises along the rocks and descends in about one hour towards Elbassan [Elbasan]. We left the river to our left. Further on, it flows closer to the town because, as I was to notice the next day, there is very little distance between the town and the Great Bridge on the route to Bérah [Berat], which is 350 paces long, with eleven arches separated by niches, two of which are set on a little island. This bridge is entirely horizontal. The plain of Elbassan is not too large and is surrounded by mountains on three sides. It is suitably cultivated, but it must be very muddy in the wintertime. The large number of fruit trees that we could see all around us gave the town a very agreeable appearance. The immediate surroundings, the suburbs so to speak, consist of plantations of olive trees which have two additional usages: they serve as the Muslim cemetery and as pastureland for the sheep that wander around among the tombs. There are many graves, which would seem to indicate that the population was once quite considerable. I was told that recently Muslim homes had fallen in number from 2,000 to 1,400. In Elbassan, as in Tiráná [Tirana], there is a large, rectangular-shaped field surrounded by ancient cypress trees. This is where the Muslims gather for their Bayram ceremonies. Formerly, Christians were not allowed to own shops in the bazaar (as the Christians used to do to the Jews). This situation has been modified and today there are five or six non-Muslim shops mixed in among the others. What is particularly interesting about this bazaar, like the one in Tiráná, are the large number of gunsmith shops that one sees. One really senses that one is in Albania. European weapons have not yet penetrated the market. They use the same extremely long flintlock rifles with their curved wooden butts covered in metal. The butts are so short that one can hardly imagine how it is possible to use the rifles. The poorness of the bazaars in these oriental towns is such that, whenever I looked around for some locally manufactured object as a souvenir or out of pure curiosity, including at the bazaar of Scutari [Shkodra] which is said to have 1,500 shops, I did so in vain. I know of only three places in European Turkey where cutlery is actually made locally. These are Prisrend [Prizren] which would seem to be the best, Séraïévo [Sarajevo], and Grabova in Bulgaria where it is inferior in quality by far. Elbassan has two Christian neighbourhoods, each of which has about one hundred homes and a church. The first one is inhabited by Albanians of eastern rite, and the second one by Vlachs. The bishop, who also serves as bishop of Durazzo [Durrës], lives in the Albanian quarter. His diocese, the last one of this rite in the northwest, consists of only 1,200 homes, scattered among a number of towns and villages. The Vlachs continue to recognize his authority although they have a church and a school of their own, where Greek is the official language. Okrida, which also has a good number of Vlachs, is the only place, as far as I know, where they have separated from the patriarchate and have joined forces with the Bulgarians. In Elbassan, as in Tiráná, the kaimakam is a local bey. Here, he has a huge villa in traditional style, but it is just as run-down as it is old. Formerly, there was an employee, a Frenchman, at the telegraph station who was responsible for services in foreign languages. 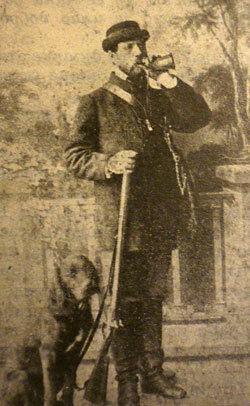 As in Prévéja [Preveza], the elimination of his post gave rise to general and legitimate protests. Aside from the incertitude that arises from the transmission of telegrams in a writing system as imperfect as Turkish, the number of Ottoman subjects who actually know this language is quite limited. If one wanted to save money by reducing the number of employees, it seems to me that the administration should require of its Turkish employees a knowledge of French or of the most widely used native languages. In Elbassan as in the other towns of upper Albania, the Christian women wear Muslim dress, at least when they go out. They are veiled and do not even show themselves to visitor in their homes. At the end of the orchards, on the road to Tiráná, there flows a river in a broad and virtually waterless bed, the Garamika [Zaranika], which has a two-arched stone bridge. A narrow valley leads into a larger one, called the Koûth [Kusha], planted with olive trees. After proceeding up the course of this little river, we continued along a terrible path, up the very long though not particularly steep slope of Mount Grab [Krraba]. There is some vegetation but only at the summit and on the equally long northern slope. The ground is of shale and is muddy. Boulders are rare. At the foot of this slope flows the river Erzègne [Erzen], called Arzén on the maps, which is not always easy to ford. Beyond it stretch waves of hills covered in bushes that are gradually being cleared for farmland. They lead to the plain of Tiráná. Tiráná, in my opinion, is one of fairest sites in all of European Turkey. There is not much to the town itself, but water flows everywhere and there are great numbers of trees of a wide variety of species. Its immediate surroundings are taken up by orchards and fields bordered by verdant hedges (something quite rare in Turkey), as well as by trees that rather make it resemble a landscape in Normandy or Lombardy because the vines climb on huge pollards that are planted especially for them. Here they are hackberries instead of the Italian elms. The cypress trees are huge, but the olive trees do not seem to do well here because the climate is always cool. Here, too, there are about one hundred Vlach families who have a school and are in the process of building a large wooden church. This is the northernmost point that this ethnic group has reached. At the same time, the Catholic element is also evident, although there are not many of them. The parish consists of a mere seven families, most of whom have come from elsewhere. There is a church and a parsonage, both built about a decade ago. The priest is an Italian Capuchin. The Christians here, although they are not numerous, are the only ones in the kazas of Tiráná and Króya [Kruja]. Their decline is attributed to the long wars waged by Scanderbeg during which the surrounding country was a battlefield and a theatre of continuous massacres. In addition to this were the ravages committed by the invaders who were driven by such zeal that they permitted no faith but Islam. The foundation of Tiráná is, by the way, much later than the conquest. All the Muslims are Gheg Albanians. The only place on this journey that I actually met real Turks was in Okrida. A broad plain stretches from Tiráná to Scutari. The distance between the two is calculated at 18 hours. This plain is bordered on the west by hills that eventually disappear towards the sea, and on the right side by a range of high mountains broken up at intervals into pyramid-shaped sections with huge gaps between them. The section to the east of Tiráná, one hour away, is called Daiti [Dajti]. The impassable mountains of Matt [Mat] that stretch to the Dibras are located behind this chain. The plain up to the vicinity of Alessio [Lezha] is covered in good part by huge marshy woodlands, and getting through them is extremely difficult in some parts. I met a Frenchman who had just explored them and endeavoured, without success, to negotiate with the pasha of Scutari to get the rights to exploit part of these forests. The Frenchman was an associate of Mr Piat, and is striving with him to negotiate with the Greek government about some business ventures for which the natural resources, I believe, are still lacking. When I crossed through these forests, which seemed to have suffered much over the last twenty years judging from the travel reports published at that time, I found only two small sawmills that sold hardly anything but alder wood. The oak trees are reserved for the State, although the government does absolutely nothing to protect them from the damage done to them by the inhabitants and shepherds. There are very few of them that have not been cut back to pollards and, in addition to this, large regions have fallen prey to recent fires. 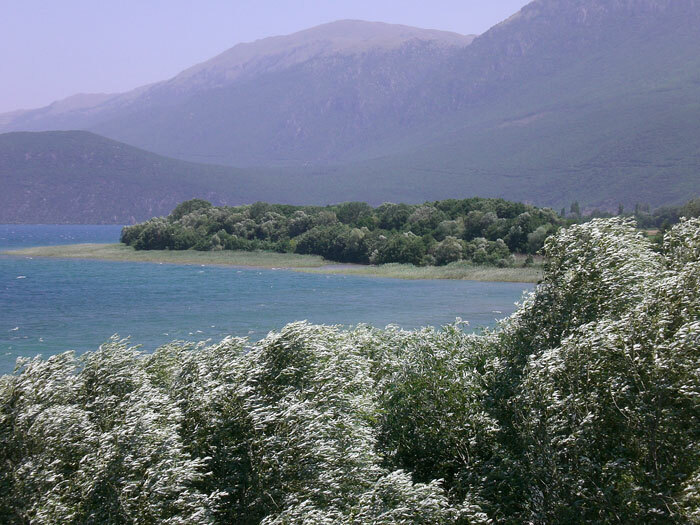 It is a pleasant surprise, travelling from arid Epirus, to come upon a countryside of verdant forests, but the obvious traces of devastation everywhere confirmed the impression I had gained in the course of many voyages that the forests of Turkey are bound to disappear in the near future without having given profit to anyone. With their disappearance, a resource of great importance will have been lost. The Liana [Lana] is a small river whose course has been altered. It flows through the town of Tiráná, which presents no inconvenience because the streets are paved. On the way to Króya, one crosses several other rivers, one after the other, such as the Tiráná, the Terkoúza [Tërkuza], the Zézi [Zez], etc. It is four hours from one town to the other, but the latter town, Króya, is separated from the plain by a ridge of rocky foothills which require over an hour to cross. Behind them are other heights, planted in olive trees. 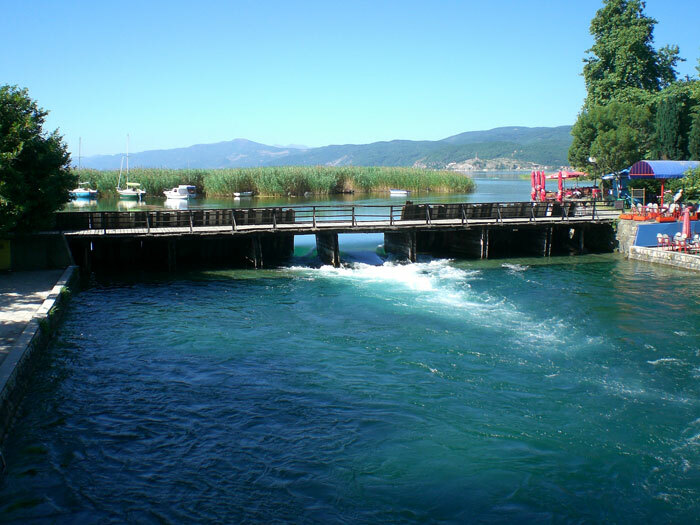 From one of them gushes the strong-flowing spring (Króya or Kroua) which gave its name to the one-time residence of Scanderbeg. The unseemly ruins of the heroic adversary of the Turks rise on a rock that is separated from the mountainside by a ravine. Access to it is through the bazaar. The 800 houses here ‒ as I was told, although the figure seems too high to me ‒ are scattered as they are in a typical Albanian town, and are situated here among the olive orchards on isolated hillocks where each owner can keep a watch on his neighbours, and on the lower slopes of the high ridge that is a continuation of Dalk [Dajti]. From here, there is a beautiful view of the sea which is six or seven leagues away, of the peninsula of the town of Durazzo [Durrës] and, in the distance, of the hills of Dulcigno [Ulqin/Ulcinj]. Although the site is quite a bit higher than the plain, the climate is much warmer than it is below. The bazaar consists of eighty to a hundred shops all huddled together that, as usual, form a dark little alley. There is a kaimakam in Króya who resides in a dilapidated house in the castle as happens in all Turkish towns where there are remnants of a fortress. It is an odd place for the head of the administration, as if he wanted to exhaust the inhabitants with a long climb on their way to see him. The descent from Króya to the plain through a series of rather high hills down to the little village of Deruéní [Derven] lasts about two hours. In Deruéní there is an Albanian Catholic priest, too, although his parish consists only of a few families. Here begins a forest that, despite considerable clearings, stretches to the river Matia [Mat]. Two hours from here, in one of the clearings, is the village of Mamouràs [Mamurras] or Minaré-kouí [Minare-Köy] which has a mosque, a wretched han, and a guard station of zaptiehs. At about the same distance from there, is a creek that gushes with a great amount of cold sulphuric water called Ouy’i kyélboetae [Uji i qelbëtë] which is considered good for skin diseases, but the source will certainly remain unused for as long as the trail to reach it is in such a bad state. The Catholic village of Lyachti [Laç], with about twenty houses scattered around in some olive groves, is only half an hour away. An hour and a half from that village, in the mountains, is the residence of the Archbishop of Durazzo [Durrës]. The location is called Delbinichti [Delbinisht]. It is three hours from Lyachti to the river. For part of the way, the road takes the form of a narrow stone trail but many parts have caved in and are covered in water. The Turkish government, that did not build it, does not bother to repair it even though, like the road I took from Okrida, it is a strategic thoroughfare for commerce and is used by the post. Recent clearings on the two sides of the river have created huge fields surrounded by hedges. They are cultivated by their owners. These are highlanders who come down to the plains at certain times and are decimated by malarial fever at harvest time. A merchant from Alessio [Lezha] told me that there was a fortune to be made there if he could only find manual labour for the farming. The Matiya [Mat] river that flows in a wide bed of gravel which is usually half empty is an extremely dangerous river to cross when the water is high. This is what we used: two long dugouts with vertical side walls that had been carved out like tree trunks. They were attached to one another. The horses, that had great difficulty getting into the boats, had their forelegs in one boat and their hind legs in the other. One has to pay a lot of money to use this type of ferry, leased by the State. Alessio, which is two hours from the other side of the river in a narrow and barren valley, is in a bad state. It is just a little market. There are two other villages, an hour away, that use the same name. If the project to make the port of Saint-Jean de Medua [Shëngjin] suitable for ships should ever be realised (it certainly will not be carried out by the Turks), it would be to the great advantage of Alessio which is situated an hour and a half away near the mouth of the Drin river. The town would no doubt grow considerably, equalling Scutari in size. The acropolis where John Castriota died and where they are still some fine remains of cyclopean walls no longer contains any inhabitable buildings. The kaimakam lodged near the bazaar in a building of Venetian origin, the two ground-floor rooms of which served as stables. It is through one of the stables that I would have to have gone, had I not refused, to enter the residence of the representative of the Sublime Porte. I found it quite enough to have had to visit the kadi in Ersék [Erseka]. From Alessio to Scutari is a distance of six or seven hours. The rather poor-looking plain is made up entirely of farmland. We had to ford the Drin several times, but there is little water in it, even when there is much rain. Initially it is very deep but it ends up at the level of the fields. The last time we crossed it, before entering Scutari, we did so on a huge wooden bridge which was most certainly no great architectural achievement. I do not believe that I need say much about Scutari, which is sufficiently well known. Despite its spread, it is not a city in the sense we normally give to the word. But does the Turkish part of Constantinople even merit the name of a city? To conclude this work, I note that I have just been informed that the Pashalik of Scutari has lost its independence and its administration has been transferred to Monastir [Bitola]. I cannot help but express my astonishment at such a measure, given the distance between the two towns. After all, I have just concluded the journey between them, with the exception of the ten hours that separate Okrida from Monastir. To this long day, one must add five other equally exhausting days of travel on terrible and indeed dangerous roads, as I have described them. Six days! This is equal to the distance between Marseille and Constantinople. It is rather doubtful if the inhabitants of Scutari who have official business in Monastir and must go there, can get there in that time. Liaskoviki, Albanian population, 800 houses, of which 80 are Christian. Among the Muslims, there are many Gypsies and nomads. A church built seven or eight years ago, a small school whose teacher is paid by the Bishop of Konitza. Kolónia, a region comprising 16 villages, of which two or three are Christian. Ersék, the capital of a kaza and centre of the plain of Kolónia. It has authority over 60 villages. The village itself has only five or six houses and four inns, with a mosque and a Turkish school under construction. Gortcha [Korça] is the seat of a mutessariflik. Albanian, 1,500 houses, of which 200 are Muslim. 600 shops, two inns that are not bad, 20 hans, two churches in the town itself and three others outside. The Christian cemetery was founded recently and, as a rare exception, is situated outside the town. One bishop, eight priests. Two mosques, one of which is quite small. No telegraph station yet, although the merchants long ago built a building for it at their own expense. Institutions of Christian education: a Greek secondary school with two teachers and one for Turkish, with 35 pupils. French is taught here. A mixed school with three teachers and 150 pupils. A girls’ school with three female teachers, one of whom for needlework. All from Athens. 180 pupils. These establishments are located in ad hoc buildings. Among them is the classroom of the mixed school which is of substantial proportions. They are together around the same courtyard, with the bishop’s residence next door. In addition to this, a building has just been finished that is to serve as a boarding school or free school for small children of both sexes. Its capacity will be for 280 children. They hope to set up a little hospital and a printing press (if the government gives its permission) for classical texts. The annual funds collected are 100,000 piastres, in addition to voluntary contributions made by the inhabitants. It is all administered by a society calling itself the Fraternity of the Poor. Cereals are an important business here. One hour from town there is a lignite mine which anyone can use freely, the lignite being used for heating. The population of Gortcha and all the country that stretches from the Samarina [Sarandaporos] river, 11 hours from Ianina, to Lake Okrida, is entirely Albanian. The word Turk, here and elsewhere, does not signify an Ottoman Turk, but simply a Muslim. Around Gortcha there are only two Bulgarian villages and a Vlach one with 350 houses. Okrida is a mutessariflik of 2,000 houses, of which 800 houses are inhabited by Anatolian Turks, 200 houses by Vlachs, and 100 by Bulgarians. There are ten churches and currently two bishops, one Greek and the other Bulgarian. Struga has 800 Muslim and Bulgarian houses, a church and a Bulgarian school in an isolated cemetery. It is the centre of fishing on the lake. Elbassán (which is subject to the government in Prizren) has a kaimakam, 1,400 Muslim Albanian houses, 100 Orthodox Albanian houses, 100 Vlach houses, about 20 mosques, 12 of which have minarets, two churches and one bishop. Tiráná has a kaimakam, 1,200 Muslim Albanian houses, 120 Orthodox Vlach houses, seven families of Albanian Catholics, and 800-900 shops. Most of the Christians have one. The Catholic church has an Italian Capuchin priest, There is an Orthodox church and a school. The kaza of Tiráná consists of 160 villages, but they are all small, with about 30-50 houses. The population is entirely Muslim Albanian. All types of fruit grow here and the climate is excellent. Króya has a kaimakam, 800 Muslim houses, 80-100 shops and many olive trees. Alessio has a kaimakam. This name is given to three different settlements. These are two villages and the bazaar located in a bad position on the road, right near the Drin, an hour and a half from the mouth of the river.